If you've been looking for a Christmas present for your 928, this will have your car thanking you for years to come! 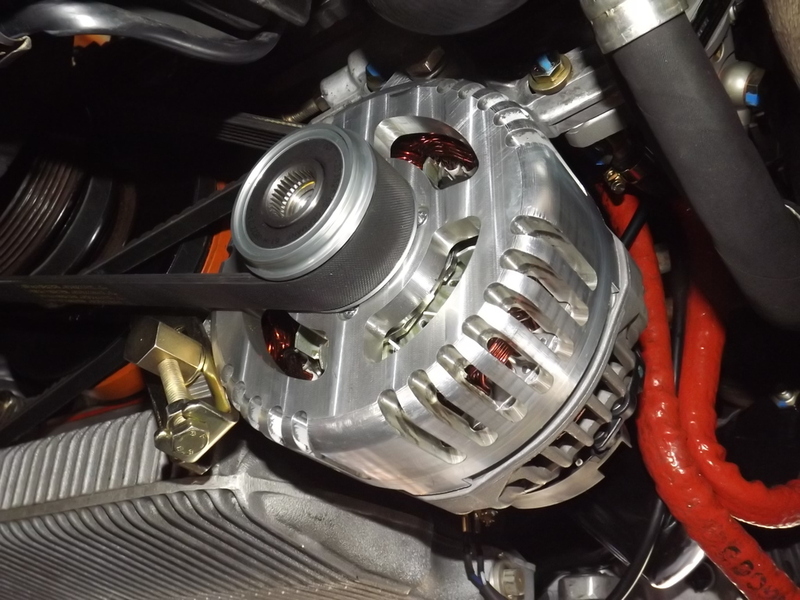 After over a year in the making, it is finally here....The Ultimate 928 Alternator. No more turning off your headlights, turning off the headlights, and reving the car up to close your sunroof! 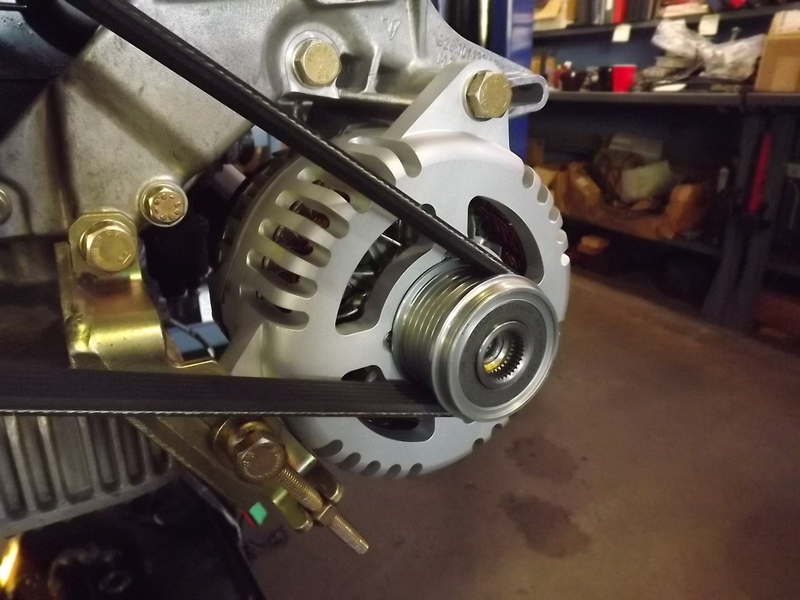 I took a state of the art, new generation, high output Bosch Alternator and modified it for use in the 928 application. 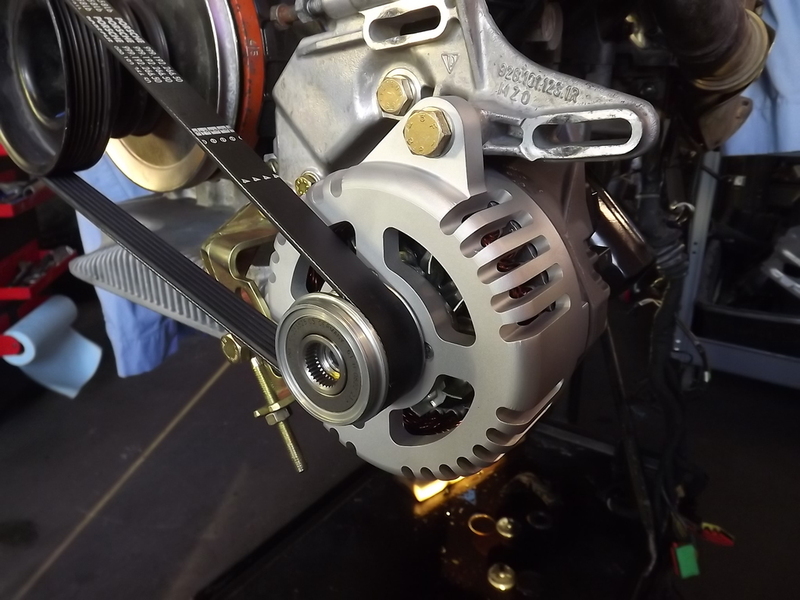 One pound lighter than the stock alternator, this alternator fits perfectly.....with the original brackets and hardware. All you need to do is bolt it on and attach the field wire. No excuses, no nonsense....it fits in the original location....perfectly! The result is 80 amps of output at idle and 150 amps of output by 2500 rpms. Made specifically for high temperature engine compartments, the 928 application is not a challenge for this beast. * Brand new 80-150 Bosch alternator....not rebuilt. In testing in the 928 application, will maintain 13.8 volts with the headlights on and the A/C on high. * Internal windings directly exposed to air flow through both front and rear vents in housing. Special Introductory price, until January 1, 2017, of $795.00! After January 1, the regular price will be $995. All alternator output is dependent on a good battery, good grounds, and adequate wire condition from the alternator to the battery. Generally, the positive cable that runs from the battery to the starter motor is adequate for proper charging. If you have my replacement "14 pin" wiring loom that goes from the front jump post to the starter, all my looms were constructed with a higher current capacity wire from the alternator to the starter connection. If you have a stock loom or anyone else's 14 pin replacement loom, please add in my supplementary alternator to starter cable. If you have not replaced your engine ground strap or your battery ground strap (with something other than the factory battery ground strap) replace these items with a stock engine ground strap and our custom battery ground strap. Confirm your battery is in good condition and not sulfated. Wow that looks awesome! Does this unit do away with the cooling hose? If so what do you do with the temp sensor? I've been just leaving the cooling hose tie wrapped in the general area in front of this alternator. Works great. Ampacity of the supply isn't the problem with our cars. Resistance in the various supply paths of the car is the problem(as Greg rightly mentions). Of course, this requires a lot of wiring repair that most people are unwilling and untrained to perform. Some models have replacement harnesses avail, and for those that don't, it's a messy and complicated DIY job. Awesome product, can you put one on my "to do list"? Thanks for making this Greg ! The '87 and later cars (with electric fans) are very marginal, in terms of current output. Add in a high power stereo, a higher current draw blower motor for the HVAC system, or one of my upgraded A/C systems and the charging system will have a tough time maintaining 12.5 volts, especially at night. The reality is that if the cable from the battery to the starter is good enough to crank the car over, it is good enough for 150 amps to go back the other way. The cable from the alternator to the starter was sized for the current alternator (except in the late model cars, when they increased the size of the wire.) Most likely, any car with an original loom needs one of my supplementary wires. If you have a "replacement loom", inquire with the builder about the current capacity of the wire used. The stock ground cable from the engine to the chassis is plenty adequate....when in good condition. Any of these original ground wires needs to be replaced. The stock battery ground cable is marginal....even when brand new. That crimped on brass end at the chassis side is......problematic. The primary circuit from the alternator lug to the jump post, and the power post on the driver side aren't the problem. Neither is the primary from the batt + to the starter. The starter line only gets a hot shot for a few seconds while starting, although that generates plenty of heat which I've felt several times. No, the problem, as I said is the various current paths leading away from the primary circuits which add up to a lot of paths. You mentioned a couple big ones, and those are often the culprit. Anytime we see burnt CE fuse or relay connections, and semi-melted harness ends this is an indication of latent resistance chewing up current along it's path to the ultimate delivery point(fan, motor, lights, etc). I do agree that at idle, with many circuits running like the AC on high, wipers, rad fans(part of HVAC), and some lights you are at the limit of the alternator supply. However, if all the wiring that served these various loads were cleaned up, and renewed as I've seen done before, a larger alternator isn't needed. Porsche specced the alt for a given load factor, and put in a modest reserve. The reserve they allocated is most often chewed up in the supply wiring to the ultimate end load. Sure, if a guy puts in a big stereo amp, that can affect the ampacity as well. But one would be better served to replace those old rad fan motors, clean every high amp circuit from end to end, and clean all the grounds, as well as replacing the batt ground which is another indicator of high resistance in the load paths. But, it is a very nice looking alt, and having the free-wheel clutch is a bonus on decel. Powder coated sparkly purple. Do you have that? Otherwise billet is fine with me. More 928 jewelry. Almost too beautiful to hide. LOL. Awesome job Greg.